Greetings from the Sonoran Desert! I hope you don’t mind me publishing this but I’ve been lurking here for a while, the ‘quiet’ guy living near the Burning Bird in Arizona. I love Beer Soaked and know I will find it invaluable the next time I make a visit to SoCal and need to replenish my near-empty ice chest. I’ve already preloaded your favorite beer stores into the Android, so I’m locked and (getting) loaded. Anyway, I stopped at my neighborhood beer store and had a couple of pints tonight. I brought home one that has been a favorite of mine for many years, and if you can find it in Cali, do yourself a favor and buy a bomber to enjoy. 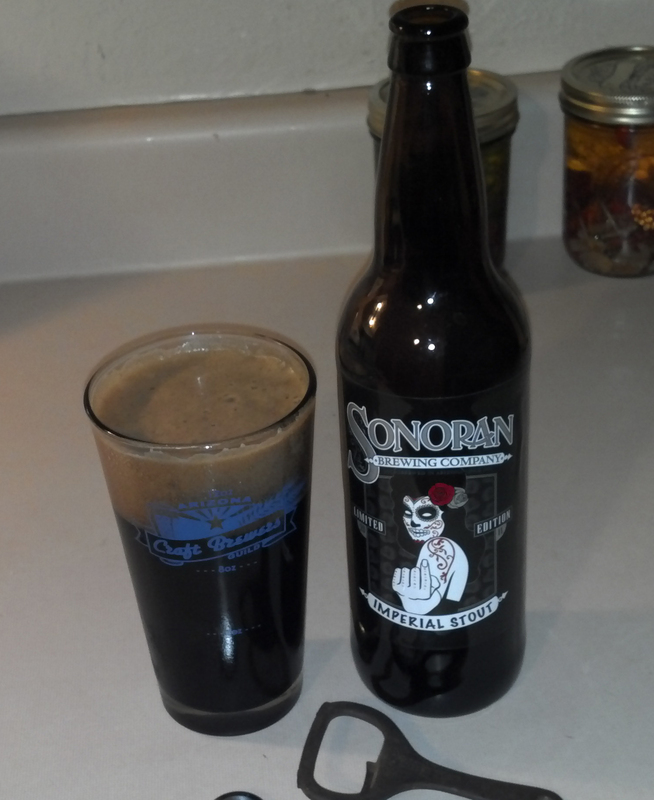 It’s called Inebriator Stout by Sonoran Brewing and clocks in at 9.1% ABV. It’s one of the most delicious Imperial Stouts that I’ve tried and I’m proud that it comes from Arizona. Cheers from the desert! This entry was posted in Craft Brew, Imperial, Stout, Strong and tagged Imperial, Inebriator, Sonoran, Stout by Jan. Bookmark the permalink. Jan, thanks for stepping out of the shadows and introducing yourself to the Beer Soaked readers! We’ve been wanting to get your slant on the craft beer movement in Arizona for a while now. So much good stuff coming from the Valley of the Sun, looking forward to more on your local beer scene. Cheers!